Perth man, Reginald Foggerdy, headed out on Wednesday from his Shooter's Shack campsite, which lies on the edge of Great Victoria Desert in central western Australia. His family says he is an experienced bushman, but had no idea the near death experience he was walking towards. The 62-year old man was planning on hunting feral camels for food and followed one but became disoriented in the meantime. He was wearing only a T-shirt, thongs and a baseball cap along with his rifle, but was without any food or water. When Mr. Foggerdy failed to return on Thursday, his brother reported him as a missing person, which started a land and air search. The police had trouble following his footprints as they would find them only to later lose them. Kalgoorlie Police Superintendent Andy Greatwood told ABC radio that they were skeptical he would survive as they believed he didn't have any water or food. Eventually with the help of local Indigenous trackers they spotted one of his thongs on Monday afternoon and from there were able to follow more distinct footprints. 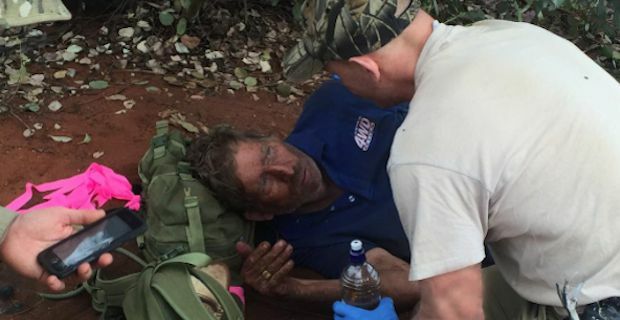 Early Tuesday morning around 6 a.m., 15km from his campsite and 6 days later, Mr. Foggerdy was found alive but extremely dehydrated and a bit delusional according to Greatwood. The last couple of days he survived the harsh conditions only by "lying down under a tree and eating black ants". He was treated onsite by the Tactical Response Group with intravenous fluids right away, then flown to the Tropicana Mine Site where he received more medical treatment, and was eventually sent to Western Australian Hospital, Kalgoorlie hospital by the Royal Flying Doctor. He is said to be in stable condition.